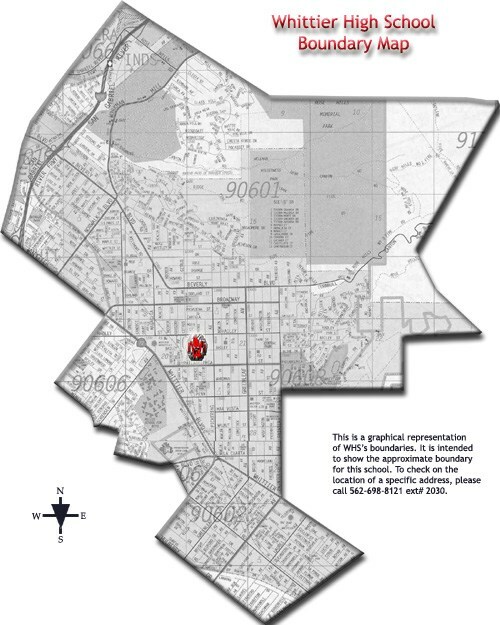 Click below for the Whittier High School boundary map. You may enlarge the map in Adobe Reader by selecting a larger magnification number in the zoom field. A magnification of 250-300% will allow you to view down to the street names clearly. The boundary map is a graphical representation of the WHS School boundaries. It is intended to show the approximate boundary for Whittier High School only. To verify a specific address within WHS's boundaries, please contant the Guidance office at 562-698-8121 x2030. Click here for all the boundary maps in the district. You may also call Student Support Services at 562-698-8121 x1180 for the most accurate information on school boundaries.